Teaching Tampa Bay to Ride! We do it all. Safely. Professionally. Our barn in Odessa, FL is a safe, fun, and supportive environment. We emphasize the respect and responsibility needed to make a successful horse and rider team that will exceed goals. We offer private riding lessons, horse boarding and training, horse show competition, summer and holiday camps, and a horsemanship club. Our highly trained lesson horses can accommodate any skill level. In 2017, we won Reserve World Champion of the American Saddlebred Breed Ambassador. In addition to winning ribbons at local, regional, and national levels, many riders notice personal growth in responsbility and self-confidence. Growing up in the Midwest, Krystle competed as both a juvenile and amateur in the American Saddlebred arena. She received her B.S. in Equestrian Science from the reknowned William Woods University in Fulton, Missouri. Krystle was honored to be named 2017 Instructor of the Year by the Florida State High Point Program. In addition, Krystle is an active member of the AMHA, ARIA, ASHA, CHA, UPHA, and USEF professional organizations and assists the UPHA in running larger shows in the area. Founded in 2007, Suncoast Stables offers customers multiple areas for riding and driving, including a lighted well-drained arena. The property features several pastures, a new 20 stall barn, and other amenities. We specialize in American Saddlebreds, Morgans, Arabians, hackneys, and roadsters. We teach lessons in Saddleseat, Dressage, Western, and Hunt Seat. Own a horse? We feature top-notch boarding and specialized training to meet your goals. Want to own a horse? We can help you find one that complements your style and budget. Leasing options are also available. Private lessons are available for all skill levels, ages four and up. Our lesson program is structured around weekly one-on-one instruction in our arena. All our lesson horses are highly trained to accommodate differing skill levels, from beginner to advanced. Stall boarding includes daily turn out and stall cleaning, automatic watering, and multiple daily feeding times with a balanced diet to ensure high performance. We also offer pasture boarding. Training programs are available for young horses, show horse prospects, and seasoned show horses. Programs are customized to each horse and rider/driver to ensure goals are met. Horses are trained multiple times per week. Try out for our Show Team! Beginners will experience the thrill of competing and winning blue ribbons at Academy level shows. More experienced riders can showcase their talents at larger regional or national shows. You will also be eligible for Florida State High Point Program awards! Horsemanship camps are offered during spring break, summer, and winter holidays for ages 7-17. "Tiny Tots" camps are offered for ages 4-6. Campers will learn about horses, do fun activities, and get to ride. Held rain or shine, it's a great way to stay active and make new friends. Interested in Summer Camp? Click here! Membership to our Boots, Bits, and Bridles Horsemanship Club is by invitation only and for advanced riders. Rigorous yet fun Horsemanship Club clinics allow members to strengthen the bond between horse and rider team. Dates vary, so check our Upcoming Events section. Interested in Tiny Tots Camp? Click here! Interested in Summer Camp? Click here! Congratulations to our riders that competed at the Pro-Am Charity Horse Show in Perry, GA in early April. Hailey Luedde rode Akeelah to victory in the huge 10-horse class of ASB 3-Gaited Country Pleasure Limit Rider. Haley Krupnick took the blue ribbon riding Hopefully in the ASB 3-Gaited Country FL/GA Owned/Trained class. Finally, Liz Moser won Acadmey Saddle Seat Showmanship W/T 9-10 riding Akeelah. FOUR weeks of Summer Camp will be offered this year! Week 1 is June 24-28, Week 2 is July 15-19, Week 3 is July 22-26, and Week 4 is July 29 - August 2. Each day runs from 9AM-4PM and is for ages 7-17. Come for a day or a week! Campers will learn about horses, go for a ride, and engage in other fun activities. Click here for more information or to register. There is also a Tiny Tots camp for ages 4-6 held June 12-14. We are committed to providing you a great experience with our private instruction on our highly trained lessons horses. Lessons are by appointment only. We do NOT offer trail riding. For more information or to schedule a lesson, please call us at 813-368-0666. You must turn in a completed Rider Application, Release Form, and Medical Form (links below) in order to ride or interact with horses. Please plan to arrive 10 minutes before your scheduled lesson time. Payment must be rendered at time of service. Lessons can be purchased individually or through a package. Proper riding attire is required, which includes long pants and closed toe hard-soled shoes. Helmets are provided. Krystle has gone above and beyond with training my daughter and helping instill values like dedication, honesty, and resilience. She now competes at the highest level; it's the best thing that has happened to her. I couldn't be more grateful! I know that my horse is receiving the best of care and that he is healthy and happy. Also, my daughter has attended several summer horse camps and enjoyed every minute. I would highly recommend Suncoast Stables to anyone! All the riders at Suncoast Stables support each other's achievements. 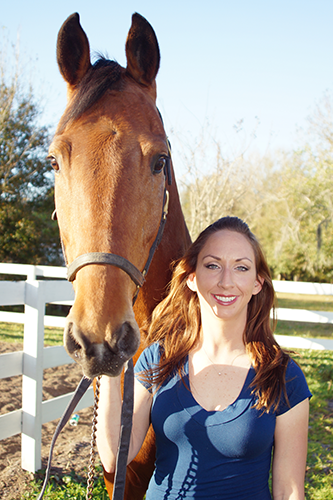 Krystle is a fun, energetic, and positive person who emphasizes proper care, respect, safety, and good horsemanship. We wouldn't go anywhere else! ©2019 Suncoast Stables. All rights reserved.